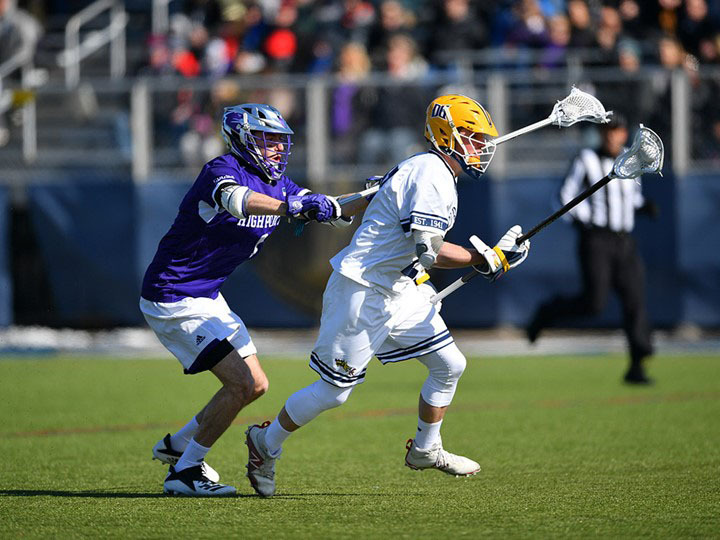 Drexel University’s men’s lacrosse struggled as they started their 2019 season, with a record of 4-5, mimicking their 5-8 finish from last year (Photograph courtesy of Drexel Athletics). After struggling to a record of 5-8 last season, the Drexel University Men’s Lacrosse team looked to bounce back in 2019 with a winning record and more consistent performances. Though they’ve had some success, the Dragons have continued to stumble against stiffer competition. After nine games, the Dragons have a record of 4-5 with all four of their remaining games coming against Colonial Athletic Association opponents. The Dragons’ most impressive win this season so far came March 10 against Villanova, who ranked No. 11 in the country at the time of the matchup. The Dragons won that game by a score of 15-10 in the final game of the Philly 4 Lacrosse Classic. The team had dropped the two games prior to the Philly 4 Lacrosse Classic to unranked opponents (the University at Albany and Jacksonville University) by a combined total of eight goals. This unpredictable level of play has left the team hungry for more. Drexel’s most recent game came March 30 in a CAA conference matchup against the University of Massachusetts, which ranked No. 16 in the country at the time of the matchup. The Dragons were led by juniors Matthew Varian and Reid Bowering and sophomore Nick Fox, who accounted for seven of Drexel’s nine goals in the game. The Dragons led UMass by a score of 6-2 heading into the third period thanks to a strong defensive effort. Unfortunately, the second half saw a shift in momentum as UMass took control of the game. In the final two periods, UMass outscored Drexel 8-3 to pull out a hard-fought 10-9 victory for the Minutemen. The Dragons were outshot 42-31 and also had 12 fewer ground balls than UMass throughout the course of the game. Despite the Dragons’ early season success with extra-man opportunities, the unit went 0-3 in opportunities against the Minutemen. Drexel’s next game comes April 6 as they host the rival University of Delaware Blue Hens, who currently have a record of 8-2. They look to avenge last year’s 17-8 throttling against Delaware.